I enjoyed the Radical Book Fair on Saturday, particularly because it hosted the award ceremony for the first Little Rebels Award for radical children’s books. Sarah Garland was the worthy winner for Azzi In Between. Here she is with part of her prize, a picture of ‘little rebels’ by Ros Asquith. 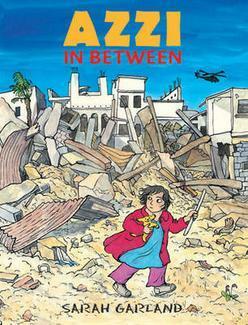 Azzi is a powerful graphic novel about a refugee girl and her family. A great book for refugee children to find themselves in, and a valuable insight into how it feels to be a refugee or asylum seeker for children fortunate enough not to have had to flee their home and country. Garland talked in an earlier session about the inception of the book. She was living in New Zealand, and met lots of Burmese families who had undergone desperate journeys to reach safety. Since the library had no children’s books that explored their plight, she set about writing one. Usually her books spring purely from her imagination and her experience, but she did huge amounts of research for Azzi, and got help from teachers, librarians, and families. Azzi is based on a Burmese child (although the child in the book is middle eastern) who was closed down emotionally for a long period, but who over time started playing in school, and whose face changed as she did so. In reality, many refugee families lose relatives, often in horrible circumstances, but Garland decided to temper that reality because of the book’s intended audience. She chose graphic novel format to reach as wide a readership as possible. Having encountered families where parents can’t communicate about the trauma they have been through, she wanted refugee families to be able to share the book together, so needed a format where the text was not absolutely necessary. I loved talking to Garland after the ceremony, especially as her books were firm favourites with my children. I was delighted in her reaction to the fact that I showcase a number of her titles, including Azzi, on courses for teachers and librarians. I was also very interested in what Jeanne Willis said about her shortlisted book. Wild Child is a clever, thought-provoking picture book about the last wild child. It arose from Willis’s passionate belief in the need for children to experience freedom, and not to be constantly rule-bound and organised by adults. ‘Wild Child faces extinction’, she said. ‘She needs protection.’ An important book. The other titles in the running for the award were The Terrible Thing That Happened to Barnaby Brocket by John Boyne, which I reviewed, and Hans and Matilda by Yokococo.